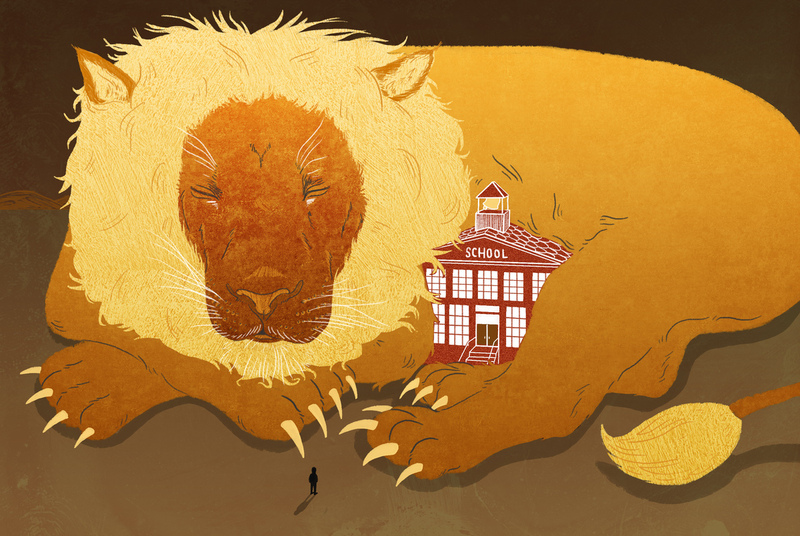 For Kids, Anxiety About School Can Feel Like 'Being Chased By A Lion' : NPR Ed Anxiety is the most frequently diagnosed mental disorder in children. A unique school in Fairfax, Va., tries to help students with severe anxiety who have trouble going to class. Every morning, Mia and Chris tape a red or a green piece of paper to their front door. It's a signal for their son's bus driver. Green, pick him up. Red, keep driving. On this morning, at 6, it's not looking good. "You don't want to get up?" Mia asks Jared. "Just go for a little while? It's only a half day," Chris tries to coax his son. Mia and Chris, in Fairfax, Va., use a red or green piece of paper in the morning to tell their son's bus driver whether or not to pick him up. Everyone feels anxious once in awhile: dry mouth, sweaty palms, a pounding heart. In fact, anxiety is the most common mental health disorder. But for some kids out there, like Jared, anxiety is such a debilitating condition that they may not even make it to school. Jared hasn't been in three weeks. The day before, Mia says, she pushed him so hard that he retreated into a fetal position. To protect their privacy, we aren't using the family's last name. It wasn't always this way, Chris and Mia say. When Jared was younger he was a straight-A student, a perfectionist. Then at 13, he was hospitalized for a simple appendectomy. "This fear of going back to school and having to make up all this work. He was really, really upset with himself," says Mia. "He kept having stomach cramps, which in hindsight was related to anxiety." Mia and Chris admit they didn't see his anxiety for what it was. They felt increasingly helpless. Their gentle, funny son was refusing to go to school. They tried everything: cajoling, carrying him to the bus stop, even calling the police. Since then, Jared's been through a lot. He was diagnosed with severe anxiety and has been through therapy, hospitalizations and different medications. "Anxiety feels no different if you're being chased by a lion or you have to go to school," says Erin Berman, a clinical psychologist with the National Institute of Mental Health. Some grow out of it; others don't. "They may look like they're not doing their homework, they're not paying attention," she says about these anxious children. But, "their mind is thinking about all the things that are scary." Jared has good days and bad days. He says, even on a good day, the hard part about anxiety is the choices he has to make, staring first thing in the morning. "What am I going to eat? I might be cranky if I eat cereal, the wrong type of cereal. And if I eat the wrong type of cereal maybe I won't be able to taste the milk." Jared says the constant noise in his head is unrelenting and exhausting. "You think back, 'Oh, I shouldn't have eaten that cereal and now I'm cranky because of this. Why am I talking to people? I'm probably making them feel like I'm a bad person and I'm not a bad person.' "
But the worst part? Crawling under the blankets, he says, doesn't make that noise go away. "At the end of the day when you think back to all those choices you didn't make and that you decided to stay home you realize, 'Oh, that wasn't the right choice either.' "
When Jared's parents do post that green piece of paper and he does make it to school, it's to a very special one. It's a program in Northern Virginia called Aspire, specifically geared to students with severe anxiety. Students in the Aspire program work individually at computers separated by privacy screens. The partitions help the students feel less anxious. Sharita Marshall is a social worker in the program. Today, there's a new student enrolling and Marshall is showing him a secluded back entrance students can use that leads straight into the classroom. "You can just knock right here on one of these windows like this," she taps a couple of times on the glass. "Then walk around and Ms. Bottle will let you in," she explains. Ms. Bottle, Rose Bottle, runs Aspire. She says being able to come in the back of the school is just one way the school accommodates students with severe anxiety. Students can also come into class after the bell so they don't bump into other students. Teachers are told not to make eye contact or to greet Aspire students in the hallways. Inside this classroom, windows are covered with an opaque film so no one can peer in. 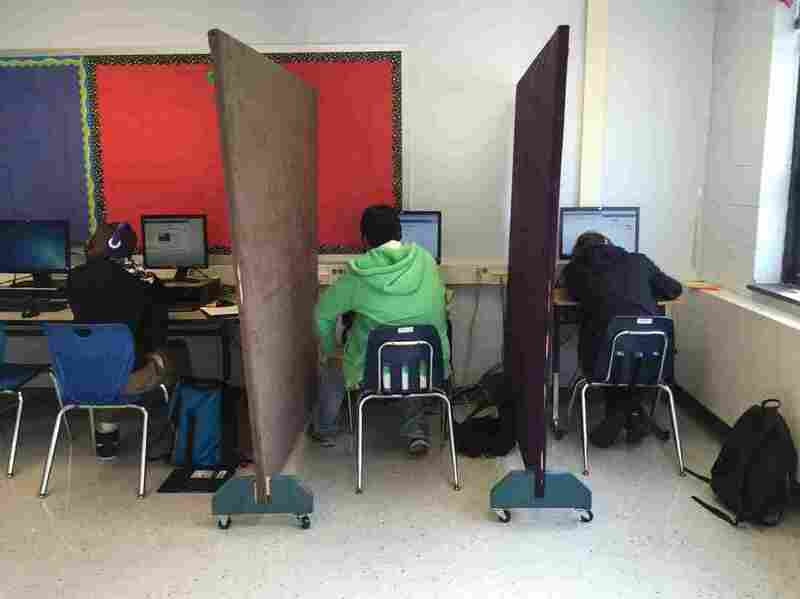 And the desks are partitioned so some students can't see the person beside them. "I have a couple kids who really prefer that separated space," says Bottle. Most of the 17 students in this program have missed more than six months of school before coming here. They take online courses so they can work by themselves, at their own pace. And there are also several therapists and social workers who work with the students, like Sharita Marshall. "During the day I keep my basketball hoop here," she motions over to a small basketball hoop. "Sometimes, with some of the boys it's a lot easier for them to talk with the basketball so they're able to, you know, not look at me," Marshall says. She also uses a form of exposure therapy — it may start in the parking lot. "Mom or dad may just sit with the kid in the car for 15 minutes, 20 minutes, and then they leave. And they do that for a week. Or maybe two weeks," she explains. From there, maybe they come into the front office for a few minutes, "then a conference room, then a classroom." It's expensive though. The Fairfax district spends on average just under $14,000 for each of its students. The Aspire program? About twice that. It's not a straight line to recovery, though, and that's something Jared's parents, Chris and Mia, know all too well. This morning their other children are heading off to school. But Jared is still in his room. 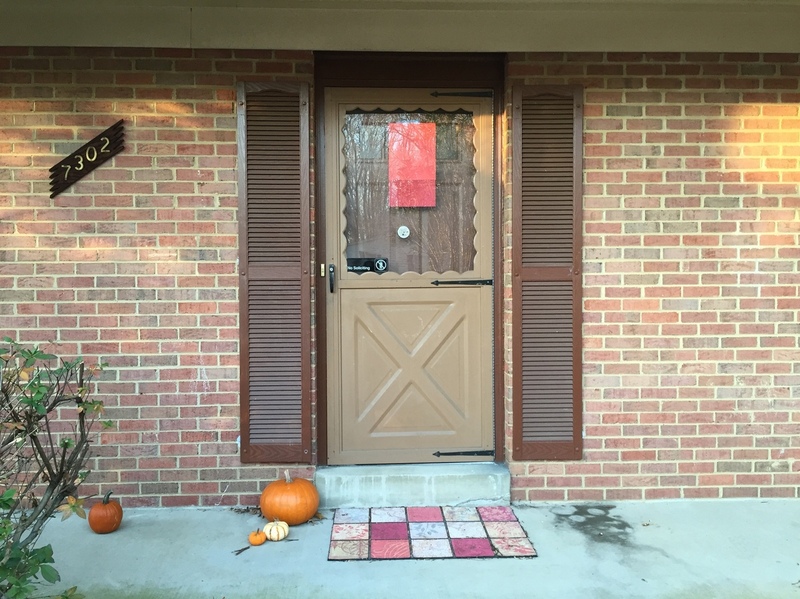 Mia and Chris have taped a large red piece of paper outside their front door. The bus driver won't stop. Tomorrow, maybe, things will be different.